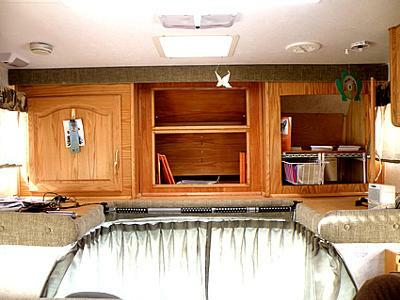 When you are living in an RV permanently, there are several adjustments that you have to make. You obviously will have less room for stuff than you would in even a small house. It is important that you find a way to creatively store the things that you feel you absolutely need and to keep everything organized so that you can actually move around and live in your RV without it becoming a tangled, twisted nightmare of stuff. 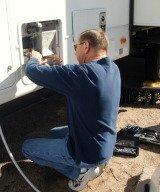 You also have to be aware of the safety concerns about living in an RV and all of your stuff. Anything that is not put away or anchored down could become a danger to you if there is an accident of any kind. When you are about to move from a house to an RV, the first step is to decide what you really need and what you can be without. Sort through each item that you have put in the “need” pile to make sure that you are absolutely sure that you do need it and that none of them have been duplicated at all. Next, think about how you will use each item and where it could possibly be kept once you move it into the RV. Instead of having several items that can only do one thing, the RV will make you adopt a more versatile lifestyle. Okay, in your home you had twenty different skillets of different sizes, and you used them all differently. In the world of the RV, you cannot have that- a single, medium sized skilled can make any of the foods that you are cooking and will take up less space. As an added bonus, you will be saving time and energy on washing dishes as well. Other options for multi use items include using a body wash and shampoo product instead of having several different bottles in your very, small bathroom area. Make sure that you use a product that will not require a ton of water for rinsing and make sure that it is safe for the environment wherever you are. Once you go through your closet and choose the clothes that will suit you the best, it is time to find a way to store them in your RV. Using the space saving hangers that are advertised on the infomercials and available virtually everywhere now can be a great solution. For items that you cannot hang up such as socks and lingerie, you can roll them up and put them in small plastic totes so that they can stay together and put away. Add in a sachet or a laundry softener sheet if you are concerned about the smell of the tote and the clothing stored inside of it. You can make due with a single set of sheets and towels, washing them between uses when you are doing your clothing and then putting them right back where they belong. Besides the pegged shelf for the beautiful pillow cases that will hold many items and the folding instead of hanging ideas. I realized I didn't say all of the uses of the exotic boxes I want to keep, one is the perfect size for a tiny trash can in the bathroom. I will most likely since it is just me and pets, to turn the dinette into a pillowed folded down area for the hopeful guest I will have, I am very relaxed and I have already purchased breakfast tables, so I will put one in the middle of the dinette bed, just gotta sit Indian style. That way I can also use quilts mom made me and use personal cushions. I have a small canoe shelf that I have placed a wonderful collection of treasures of nature and will add liquid acrylic over the items and slap a few legs on and I have a small coffee table that is one of a kind and reflects my love of nature. I didn't look close enough at the kitchen storage area for pet food and beer, (lol) But one skillet that is deep and a pot to boil in and a cake pan for all baked items and one casserole dish should be enough in that area. I am taking very few plates yet for company I have really cool paper plates and serving platters. some models I couldn't believe they had so much indoor space, yet the outside basements were tiny, no room for the bike etc. Yet I did see one model that had huge storage beneath, but still not good enough reason to get it. I am determined to get the coachman 32BH, It has bunk beds that will be able to handle a lot of storage, especially since it is me a dog and two cats, but I will hide the stuff behind a curtain, I am determined to make my RV take on most of the items I really really want and need (kitty Litter) I will rarely have anyone travel with me, and the 32BH also has a couch. I am still considering removing that big bed and turning the bedroom into a library/computer room and store by books and crafts in the other parts of the closet. the funny thing is that I have 3-4 coats that I cant decide on, but they will be folded, not hanging, If I cant fold and stack it, it doesn't go. Items that I have a hard time deciding on I place in front of where I sit so I can decide how important they are to me (make me smile) I do plan to actually put canisters on the counter that is in this model, and use everything to hold them in place, but I will make sure that several needed items are put in the canister to make it full, especially candy and cookies the same canister may need to also hold my sugar packets, dunno, I am not even a newbie yet. But by the end of this year or by end of January I should be in my new home. I refuse to only take items I need, I am going to take items I love to look at. I am not full time yet, though I will be as soon as I sell my house (which is now in foreclosure) gotta sell before the bank so I can pay cash for my RV. Anyways, I have a pegged shelf that is only about 2 feet long, that I will put in the bedroom and hang embroidered pillow cases that I add drawstrings for most anything to put inside of them, also any purse I put up will be full of under wear and socks. Also, I can still hang up most any kind of interesting bag. I guess I am lucky (if I get my coachmen class c 32BH, it is just me, a dog and 2 cats. I have beautiful exotic boxes that I can put the scissors and all the things you need all the time but cant find. I want to make sure I have fold only clothes, to me to hang clothes is a waste of space. Luckily I have only 3-4 pairs of shoes to take. For me, making everything inside express myself in some way is important, and I agree all items should be multi-functional. I have a bottle collection and I want to put shampoo and liquid soaps in those just so I can keep them. I will find out (maybe the hard way) if my pre-plans will work. I had concerns that I first commented and asked about several months ago. We started our new adventure the end of June and as I was preparing to go from a 2000 square foot house to a Class A 38' MH with 3 slide it was not as hard as I first envisioned. My main concern was my clothes, shoes, purses & crafts stuff. I found a wonderful solution for sandals/flipflop storage....Stand them up by pair back/back in a plastic shoe box. I was also able to put in 'winter' shoes with no problem, on the floor of the closet under the shelves. The biggest issue has been 'cold weather' clothes. Solution was put in a plastic storage bag that air can be removed. Ditto for extra pillows, quilt, etc. My handbag solution was pick out the 4 best bags I have plus one good tote bag and put them in a small plastic container. As far as crafts stuff, that was my biggest issue. But I chose 3 different types of crafts to keep me busy and now only have 2 plastic bins of crafts stored in one bin in the 'basement'. As far as the regular daily living household stuff, I use baskets and plastic containers all labeled to contain our necessities. Shampoos, soaps, etc are in shower 'holders' that are held onto shower walls with suction cups. I don't have an oven, stove top with a micro/convection oven combo. So we have 2 drawers in lieu of oven. That's where my skillets are and in the top drawer is all my cooking utensils, knives, etc. We have a 'slideout' storage/drawer/'serving cart' in the kitchen which is great for entertaining and the drawers hold kitchen towels, hot pads, etc. Extra drawer holds all that 'extra' stuff, ie clothes pins, cutting board, etc. Plus there's a place for my cookbooks. We also use a 3 tiered rack that has the coffee maker, toaster, coffee & sweetener containers, receipt basket, eating utensils caddy, personal pictures, etc. We have added as many personal touches to make our MH more 'homey'. Unfortunately we must return to home base by Dec 1 only because we haven't been able to sell it, but once we are able to sell it we surely won't miss a 'stick house' for quite awhile, if ever!